FLYBY ALERT! 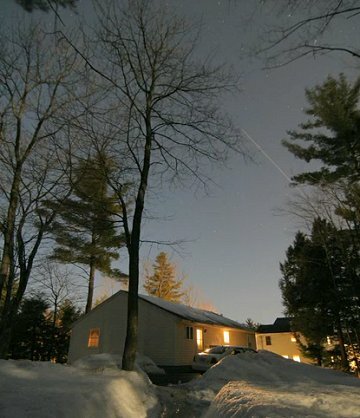 Would you like a phone call when the International Space Station (ISS) is about to fly over your back yard? Sign up for Space Weather PHONE. SPROUTING GRASS MOON: There's a full moon tonight and according to folklore it is called the Sprouting Grass Moon because it shines down on the new grasses of northern spring. Fun: Go outside after dark and look at the ground. Does the grass look green or blue? The answer may surprise you. "The nearly full moon rising adds to the already surreal effect," he says. "There were very blustery winds as you can tell from the trees." The 11-hour video (recorded by a Canon 10D) documents the night of March 24th, when the moon was nearly full and a spring wind whistled through the trees. Subtract most of the snow, add some sprouting grass, and voila!--it's tonight. Enjoy the show. BEAUTY AND THE BEAST: On March 19th, the summit of Hawaii's Kilauea volcano exploded for the first time since 1924. The blast was first thought to be an earthquake, but volcanologists quickly realized what had happened: gases bottled up beneath a vent named "Halema`uma`u" had burst forth, spewing debris over an area of 75 acres. 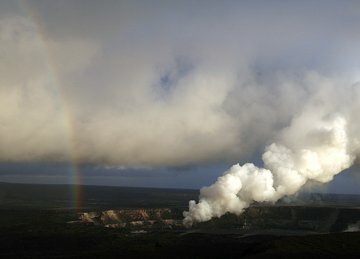 Last week, on April 14th, "I was watching sulfur dioxide emissions from Halema`uma`u, which is still fuming," reports photographer Mila Zinkova. "Suddenly I noticed a rainbow, which gently touched the crater rim." "Beauty and the Beast, I thought. But is the volcano really a beast?" she asks. "Yes, indeed. A few days ago thousands of people fled the Hawaii Volcanoes National Park and nearby villages when sulfur dioxide levels become deadly. On the other hand, Hawaiian islands were created by volcanoes. Even now Pu`u `O`o (an active vent on Kilauea's eastern flank) sends lava to the ocean creating new land and beautiful new beaches." On April 19, 2008 there were 946 potentially hazardous asteroids.